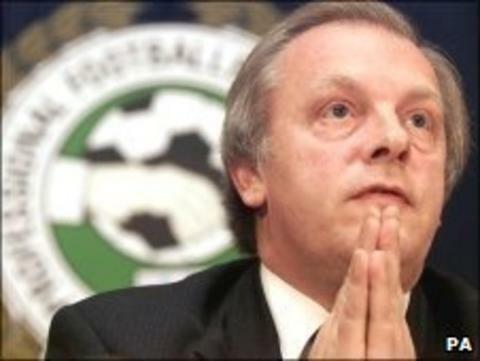 Taylor says Kari Arnason's sacking was "unjustified"
Professional Footballers Association chief executive Gordon Taylor has criticised Plymouth Argyle for sacking Icelandic midfielder Kari Arnason. Arnason was dismissed after refusing to be paid just 30% of his June wages. Argyle, who have been in administration since March, have not paid their squad in full since November 2010. "The PFA are disappointed at the unjustified actions of the Administrators on behalf of Plymouth Argyle FC," Taylor said in a statement. Taylor, who says there was no "just cause" to terminate Arnason's contract, said the club's administrators had broken Football League rules. "Such an action is a clear breach of Football League Regulations and also the Football League Insolvency Policy," he said. "The Football League support their regulations and also their insolvency policy and therefore players' contracts must be adhered to by clubs and administrators, and players must be reinstated or compromises agreed to settle the outstanding debt to the player or potentially the full value of the contract." At the time, Argyle administrator Brendan Guifoyle said: "He knew what the implications of what he has done would be. He hadn't signed the deferral, he would be dismissed - he walked into this knowing what he was doing. We had no alternative." "The players at the club have shown great support and have continued to play and train without regular wages since November 2010," added Taylor.